Custom Ear Protect (CPE) has been in the hearing protection business for over three decades. Their ability to produce a superior custom fit product at the cost of disposable ear plug is an accomplishment in itself. Not just cost, but quality factors have brought CPE to take a leading stance on noise suppression technology. Thousands of companies worldwide trust their employees to CPE’s extensive line of hearing protection devices. 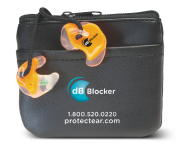 Some of the biggest brand names in the business use dB Blockers and Sensear products offered by Custom Ear Protect. From Alcoa to Kraft, Nabisco, Shell, Boeing, Chevron, Goodrich, Toyota, Air Canada, Honda, International Paper and Sterling Trucks. We believe everyone, regardless of what size company they work at, deserves the best quality hearing protection. Sound energy is expressed in decibels and is the bases of the name for dB Blockers. A test showing the noise levels within a specific plant is determined by performing a Dosimetry test. This test will show the full extent of noise your workers are subjected to over long periods of time. The final results will determine which dB Blocker a company should use to best protect their employees. CPE can arrange this test and help in choosing the right custom ear plugs that fit the outcome of the report. All noise is not the same and without the specifics it can be difficult to understand which protection is best. 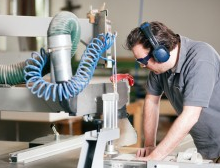 Custom ear plugs are a major factor in use and compliance within the workplace. With their highly trained staff a fitting takes just a few minutes. 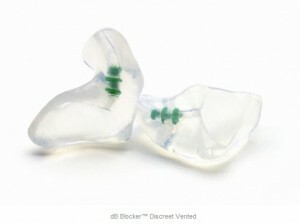 An impression is made of the ear and canal so that every dB Blocker is a perfect fit to comfort and safety alike. CPE has a FitRight Guarantee with everything they do, if the product doesn’t fit, you don’t pay. 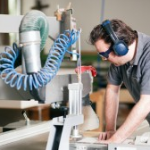 A final process of workplace implementation of the hearing protection devices is yet another important step. We at CPE have set programs to help make sure that every worker is in compliance with the safety protection being offered. Not only is the color of our hearing devices easy to see, but the comfort and fit, will make anyone want to wear their devices all day, every day. If you would like CPE to arrange a noise dosimetry test for your company, please sign up for a noise level exposure test, submit a Dosimetry Test Request form (80K pdf). On their website, the Federal Aviation Administration (FAA) publishes a detailed brochure about hearing and noise in aviation occupations. It explains how the ear works, general types of noise and the effects of noise exposure, both in everyday activities and in the aviation industry in particular. Written specifically for pilots, the FAA explains that hazardous noise occurs not only on the ground but also in the air. We would expect aircraft equipment, jet efflux, propellers, and rotors to cause noise induced hearing loss, but cabin conditioning and pressurization systems also give off noise that can cause hearing loss with prolonged exposure. Cockpit or cabin noise can be so loud that pilots have to shout to be heard buy inflatable giant water slide. Over time, even cockpit noise can cause hearing impairment. How can pilots and other aviation workers protect themselves from noise induced hearing loss? The FAA recommends limiting the duration of exposure to noise, but also recommends insertable-type earplugs. The FAA’s brochure states, “To be effective, earplugs must be inserted properly to create an air-tight seal in the air canal.” Custom Protect Ear’s dB Blockers™ are made to fit the individual’s ear exactly. It’s made of medical grade silicones that are soft and flexible, creating a comfortable, custom fit. In fact, it’s no secret that we help aviation employees protect themselves from long term hearing loss. Some of our customers are big names in the aviation industry like WestJet, Air Canada, Lockheed Martin, and Boeing. Passengers can also protect themselves from the effects of prolonged exposure to noise when flying across the country. dB Blockers worn on such flights allow those wearing them to arrive much more refreshed and less tired. If you or someone you know works in the aviation industry, share the FAA brochure with them and tell them about CPE’s custom ear protection. We are here to help.